Luckily my day job is in the healthcare field. One of my colleagues forwarded me the CDC’s “Morbidity and Mortality Weekly Report” (MMWR) for an alert regarding various bacterial infections. Blah blah blah. After I finished reading this I was noodling around the CDC’s website and I noticed another MMWR report and I was startled. It was a warning about wire grill brushes and wire grill brush danger! Take a look at this! A case report was highlighted where a 50 year old man was complaining of abdominal pain that had begun after eating a steak at a cookout. 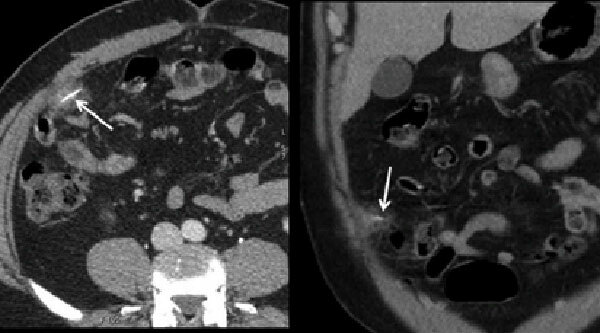 The doctors performed a CT scan of his abdomen and they found a small linear object extending through the wall of his small intestines. The doctors luckily were able to remove the object from the man’s body. After inspection they think that the object may be a wire bristle from a grill brush! This man recovered and was discharged the next day. Wow! The wire bristle probably got stuck in the grill, then as the man was grilling his steak the bristle entered the steak, which was then consumed. We have all used these grill brushes before, right? I mean how else do we get our grates to be so sparkling clean before a big cookout? 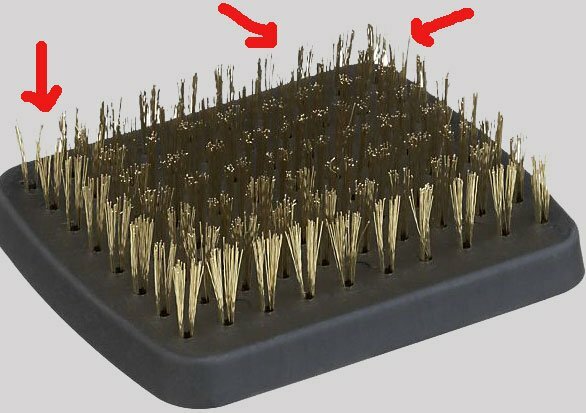 Apparently the problem is that as the metal bristles are used more and more they tend to bend and can get stuck in the grill grate and break off. They get stuck right at the intersections of the grates. 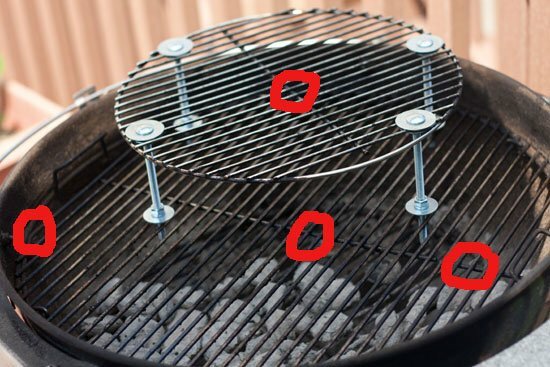 On most grates there is a metal grate bar that runs perpendicular to the rest of the grill grates. This creates a little region that these metal wires can get stuck. Don’t believe me? Look next time. I have seen these before and have managed to get rid of them by rubbing a piece of oiled napkin or aluminum foil on the grates. Take a look at this photo which shows rough circles around some of these potentially dangerous areas. So what can we do about this? Well the first most obvious thing would be to stop using metal grill brushes. However, if you want to keep using them I think that you can safely clean your grates by, as I mention above, using a balled up piece of aluminum foil and hold the foil with a pair of long tongs. Scrub this up and down the grates to remove the “gunk.” Another idea is to use a sponge. Again, use long tongs to move the sponge up and down the grates. If you are a big fan of oiling the grates after using a metal grill brush, the use of an oily napkin will also dislodge these stuck wires. I don’t know about you but I won’t be using a wire brush anytime soon. Note: I am a big fan of cleaning my charcoal grill with steel wool impregnated scouring pads. I suspect that the same thing can occur here. Sometimes I bring the grill grates into the kitchen to really clean them well with a scouring pad. These steel wool particles can tear off and get stuck in the grates as well. Be careful. If you want to read the entire CDC MMWR about this grill brush safety issue the link is here. Disclaimer: The views above are solely my own views and are not intended to reflect any U.S. Government thinking on the topic of grilling safety. 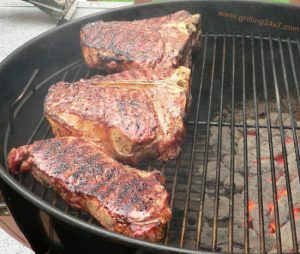 I merely like to take food photos and post them on grilling24x7.com but thought this topic may be interesting to you all. If you own an industrial sized grill (like in a restaurant), it’s best to hire an industrial cleaning service. I too am concerned about getting metal pieces on my grill. I found a grill cleaner made of wood. It works great and there is no metal left on the grill. It is called ” The Great Scrape” I have been using this for the last 6 months. I found a distributer in Orange County Calif. 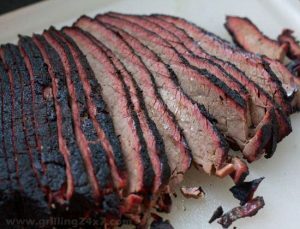 IT is a piece of wood with a taper you get your grill very hot then press it down as you scrape it forms to your grill grates. Once your wood conforms to your grill you are done. I plan on buying one for the rest of my family. It should last for many years. I cleaned my charcoal Weber grill with oven cleaner. The results were great but after cooking and eating from it most of a large group got sick from there stomach. I now use dish washing soap with a super good rinse. We haven’t had any problem since.